Dennis has been involved with the local Tasmanian Building Community and industry since 1968. 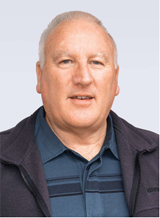 His extensive knowledge and qualifications, combined with practical experience gained over the past 40 years, is applied to the inspection and report prepared for the property you are purchasing or selling. With forty years experience in the Building Industry, Property Inspections Tasmania can give you peace of mind by providing a comprehensive property inspection and detailed report, carried out by an independent qualified builder and property Inspector.